314km cycling event starting from Llandrindod. Controls at Tregaron and Llanidloes, plus 3 information controls. A rare opportunity to enjoy the ultimate 300km route, and combine a challenging rough and smooth surface ride. Visiting many iconic landmarks in mid Wales and Snowdonia. ALL PROCEDES GOING TO NOMINATED CHARITIES. 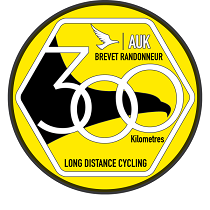 A 300km ride designed to ultimately challenge the rider. The event will require the rider to plan for some stages with rough lanes, and at times narrow lanes. the entire route is on public rights of way, some stretches are on recognised National cycle routes, and some sections are traffic-free. Although it is possible to use a standard road bike, the route probably favours a hybrid with 28 or 35mm tyres for the rough track sections. in keeping with the ethos of AUK, self sufficiency is key for this event, there will be locations to eat and drink. Riders must also be prepared to carry rations, as there may be times when riders might not be able to rely on commercial services being available.